Mikhailov, G.K. 2005. Landmark Writings in Western Mathematics 1640-1940. p. 131. Grattan-Guinness, Ivor 1990. Convolutions in French Mathematics, 1800–1840. Vol. 4, Issue. , p. 1415. 1 Hydrodynamica, Strasbourg, 1738, pp. 200–204. 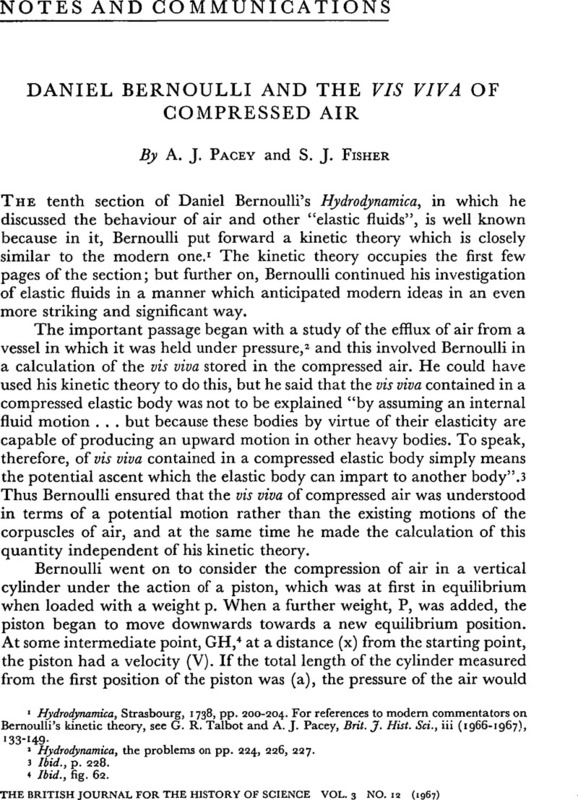 For references to modern commentators on Bernoulli's kinetic theory, see Talbot, G. R. and Pacey, A. J., Brit. J. Hist. Sci., iii (1966–1967), 133–149. 2 Hydrodynamica, the problems on pp. 224, 226, 227. 7 Carnot, Lazare, Principes fondamentaux de l'equilibre et du mouvement (Paris, 1803), p. 37. 8 MacQuorn Rankine, W. J., Miscellaneous Scientific Papers (London, 1881), p. 207. 10 Thomson, William and Tait, P. G., Elements of Natural Philosophy, part i (Oxford, 1873), pp. 1, 53–54. 11 Encyclopaedia Britannica, 3rd edn. article “Steam”, vol. xvii (1797), 770. “Mechanical energy” was here used to mean work. 12 Leslie, J., An Experimental Enquiry into the Nature and Propagation of Heat (London, 1804), pp. 454, 457, 459, 460, 472, 477, 480, 483, 500 and 501. These references all occur in the section on radiant heat and light, where phrases like “the energy of the incident rays” (pp. 454 and 459) are used in a general and qualitative sense. We are indebted to Dr. G. R. Talbot for this information. 13 Edinburgh Review, xii (1808), 130 ff. “Energy” is here suggested as a new term for momentum. 14 Young, Thomas, Course of Lectures on Natural Philosophy (London, 1807), vol ii, p. 52. 15 Rankine, , op. cit., p. 230. 16 Hydrodynamica. op. cit., pp. 231–232, 234–243. 18 Jamieson, Andrew, A Text-book on Steam and Steam Engines (London, 1897), pp. 14–19. 19 MS. in the Royal Institution of Cornwall, Truro, dated from letters in the same collection which were written in 1791. Davies Gilbert was in 1790 called Davies Giddy. He adopted his wife's surname in 1817, and we refer to him consistently by this later and better-known name. 20 The relationship of Davies Gilbert and Hornblower is dealt with by Todd, A. C., Newcomen Soc. Trans., xxxii (1959–1960), pp. 1–13. The invention of the indicator diagram, about which we have had valuable advice from Dr. D. S. L. Cardwell, is dealt with by Dickenson, H. W., A Short History of the Steam Engine (Cambridge, 1938), p. 85. 21 Encyclopaedia Britannica, 3rd edn. article “Steam”, vol. xvii (1797), pp. 765–766, 771. 22 Phil. Trans. (1827), pp. 33–34. 23 Gilbert used the word “efficacy” in 1790, and in 1827 he was trying to establish “efficiency” as a term for available energy or work. The calculation given here refers only to the part of the stroke in which the steam expands. The work done during the whole stroke is [1+loge(1+x)].